Photo courtesy of Drake Olson. A massive landslide in Glacier Bay National Park more than a week ago is exciting scientists around the world for the way it was the detected, the images of the slide and the sheer magnitude of it. 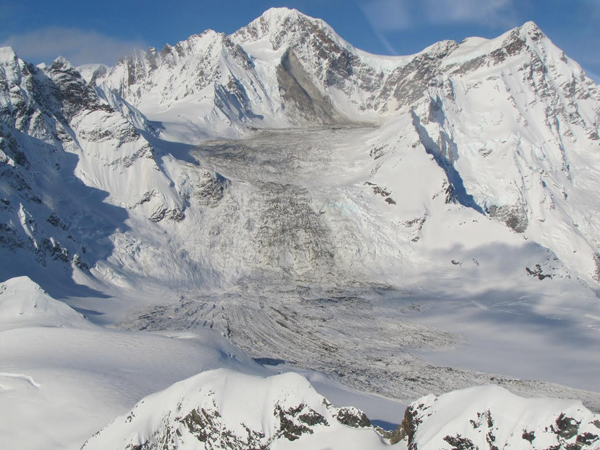 It’s also near a similar slide that occurred in 2012 on Mount Lituya. A group of scientists first detected the slide after it happened on Feb. 16. Colin Stark is a Research Professor with the Lamont Doherty Earth Observatory at Columbia University. Stark and his colleagues developed a technique, funded by the National Science Foundation, to identify massive landslides using global seismic information. Stark said when the La Perouse landslide showed up among their data, they knew something unusual had taken place. Stark and his colleagues try to identify long period waves in their analysis. Short period waves are the kinds that normally occur in earthquakes. But longer waves can show a slower surface movement that might indicate a landslide. Stark enlisted help from NASA to get an earth observation satellite to pass over the area. He also put the word out to other scientists, hoping as the news spread, access to satellite imagery would also grow. Word eventually reached Haines pilot Drake Olson who had located the Lituya slide. He heard the approximated location of this slide to be around Bradley Glacier. He was hesitant to go on a landslide goose chase, but he took the skies and on the southern end of the Fairweather range, he spotted the obvious change in landscape. Scientists estimate the break away from the mountain had started at just under 9,000 feet. Olson landed near the terminus at about 3,700 feet. The debris field is estimated to be almost five miles long with an estimated 68 million metric tons of debris. For comparison, the Lituya slide released less than a third of that. Olson skiied the area to take photos. At least until he noticed the mountain and debris was still emitted small movements and sounds. Stark says its unlikely Olson was in danger. Most of the activity took place at the mountain, when it broke away. The debris field is so large because it was moving across ice and spread out, he said. Stark said most massive slide events like these happen in Alaska than anywhere else in the world. And more happened then even scientists realize, he said. That’s because most go undetected and unseen. But the new technique used to find this slide will hopefully help notify scientists when other massive landslides occur. Stark said he can even use the analysis to go back through data to identify slides that have occurred in years previous. Doing that, he’s already identified massive slide that he says took place in 1997 near Mount McKinnely. As for the cause of these slide events, Stark said that’s harder to determine. He says most slides like Lituya and La Perouse happen on south facing slopes, and often in the summer. That gives him a small clue into possible underlying causes. Seismologists with the Alaska Earthquake Center said once they heard about the landslide they were able to go back and look for long period waves and found the event in their data. It was the equivalent of a 2.5 magnitude earthquake, they said.